The first aircraft to take off were the Lancasters and Halifaxes of No 6 Royal Canadian Air Force Group and No 4 Group, equipped entirely with the Halifax bomber. Based north of the Humber in the Vale of York and east of the North Pennines, these aircraft had the furthest to fly. The Lincolnshire 1 and 5 Groups were next, followed by No 8 Pathfinder Group based in Cambridgeshire. The Intruder and Serrate Mosquitos of No 100 Bomber Support Group would be the last to take off, the much faster twin-engine fighters slipping unseen into the bomber stream. More of them later. Like individual strands forming twine, the bombers crossed the Norfolk and Suffolk coasts, coalescing into the bomber stream in a point of the North Sea between Felixstowe and Rotterdam. The crews went on oxygen at around 8,000 feet and inevitably some aircraft returned to base due to technical problems or crew sickness. The heavily laden bombers struggled to gain their operating altitude of around 19,000 feet. The Lancaster had the best ceiling of the four engine bombers and newer aircraft could occasionally reach 22,000 feet. The Halifax operated at a lower altitude of around 17-18,000 feet. The Mosquito could reach 30,000 feet and with their high speed were difficult to intercept. German fighter pilots were awarded a double kill for shooting down a Mosquito. The bomber stream of 572 Lancasters, 214 Halifaxes crossed the enemy coast near the Belgium/Netherlands border and headed for the first turning point south of Brussels. Every raid was a sleight of hand, deception and bluff. The routes to the objective doglegged so that the target was difficult to predict. Other aircraft were operating in different areas to draw the fighters away from the main force. That night a force of Halifax bombers dropped mines off the coast of Denmark, and it was hoped that this diversionary raid would draw the German night fighters north. Additionally. Mosquito bombers flying on the same track as the main force, turned north to attack targets in the Ruhr and Kassel, again trying to draw the fighters down to defend Germany’s industrial heartland. As the bombers turned east at the Charleroi turning point, the first signs of enemy activity became apparent. The bombers route took them between the fighter bases of Saint Trond and Florennes and the visibility was so good that crews reported seeing the runway lights of the airfields. No 101 Squadron’s Lancasters flew with an 8th crewmember, a German-speaking operator whose task it was to jam and confuse the German fighter controllers. Their equipment soon gave warning that the controllers were vectoring the fighters and the operators began to try to block the transmissions with a warbling noise jammer. The first Lancaster was shot down just after midnight, not by a fighter but by flak as stronger than expected winds had pushed it north over the Liege defences. At the same time, the first of the Pathfinders crossed the German border. Nuremberg was 90 minutes flying time away and the long night’s purgatory had begun. The German air defence network had ignored the diversionary raid by the Halifax force to Danish waters, as well as the Mosquito probes into the Ruhr. With commendable alacrity, Generalmajor Walther Grabmann of the 3rd fighter Division ordered every available aircraft into the air. The deciding factor had been the ability to detect the H2S ground mapping radar transmissions of the main force and the Germans had estimated the size of the bomber stream to an error of just 50 aircraft. Junkers JU 88, Messerschmitt BF 110 and Dornier 217 night fighters had taken off from airfields as far apart as France, Belgium, Denmark and eastern Germany and were directed towards two fighter beacons, Otto and Ida that straddled the Long Leg. By the time the head of the bomber stream reached the German border, over 200 German night fighters were in the air and they were heading directly for the route the planners had chosen for the bombers. Earlier in the night battles over Germany, the night fighters patrolled boxes and were vectored onto a bomber by ground radar. This tactic had evolved into what was then known as “Tame Boar.” From the main operations center in Holland, information from multiple sources was displayed on a vast, glass screen by lights. The use of foil strips known “Window,” (chaff) had made the close control of the box system useless. Overall control from the operations centre consisted of a running commentary, usually by a woman so the 101 Squadron special operators couldn’t spoof the controller. Now a single source of information transmitted the speed, altitude and direction of the bomber stream, as well as turning points. Once in the bomber stream, the fighters found their targets by using air interception radar. The new SN 2 sets were unaffected by Window. Once the German fighter had located the bomber by radar, it closed until a visual identification was made and the fighter began its attack. Only novices would make a zero deflection attack from directly behind the bomber. Although the German fighters outgunned the bombers’ .303 machine guns, the tracer was disconcerting and destroyed the pilots’ night vision. An alert rear gunner would spot the stalking fighter and order his skipper to corkscrew, a violent diving, turning and climbing manoeuvre in an attempt to shake off the fighter. Some canny bomber pilots flew a constant, gentle corkscrew to allow the gunners to check the blind spots under the aircraft, although this made navigation difficult. Hopefully still unseen, the fighter would attempt to approach the bomber from below and behind, then pull back the stick to raise the nose and open fire. Hanging on the edge of a stall the fighter would allow the bomber to fly through the cannon fire, raking the fuselage, before diving away. The second type of attack called Schräge Musik employed vertically firing cannons. Again the fighter would formate under the bomber and open fire upwards from a few yards, usually aiming for the large fuel tanks in the wings between the engines, again diving away before the bomber exploded or fell on top of them. The bombers were armed with a rear turret of 4 x .303 rifle calibre Browning machine guns and a dosal turret of 2 x .303 Browning guns. The German night fighters were fitted with 20mm and 35mm cannons, the same calibre fitted to armoured cars and light tanks. The shells exploded on contact with the aircraft or their crews and crucially there were no tracer rounds. Survivors of an attack often had no idea it was a fighter that had fired on them and blamed flak. For the bomber crew that had survived the exploding cannon shells and burning high octane fuel in a doomed bomber, the next stage of survival was to bail out. To enable the crew to move freely around the aircraft, parachutes were stowed and to be found in the darkness, then clipped onto the harness. There were 2 emergency escape exits in the Lancaster, one in the rear fuselage for the gunners and one in the nose down in the bomb aimer’s position. Five men had to get out of this hatch which was tiny and that was assuming they weren’t pinned against deck or fuselage by centrifugal force of a spinning aircraft as it plunged to earth. Statistically, the crew of the Halifax had a better chance of bailing out, there being more and larger escape hatches. The promised high cloud at the trailing edge of the cold front never materialised and the bombers ploughed on in the clear moonlight sky. Worse, it was colder than expected at the bombers’ operating altitude and dense vapour trails poured from the bombers’ wings like glistening signposts. German fighter crews spotted the bombers before their radar sets had even warmed up. The greatest air battle in history had been joined and during the first skirmishes over the 45 mile section of the route from the German border to the Rhine, 10 Lancasters and 2 Halifaxes were shot down. But it was a running battle and the bomber crews would claim one single engine Messerschmitt 109 and 2 Junkers 88s probably destroyed with 5 damaged. What was so disconcerting for the bomber crews was the crystal-clear visibility. Normally the bombers were shrouded in the darkness, the only indication they were in the bomber stream the turbulence from the wakes of other aircraft. Some crews completed an operation without ever sighting another bomber. This night the sky seem crowded with aircraft, stark against the solid cloud at a much lower altitude. One flight engineer described the scene as looking like flies on a white tablecloth. The ongoing German running commentary told the unengaged fighters orbiting over Otto and Ida beacons, that the bomber stream was heading straight towards them. They couldn’t believe their luck. 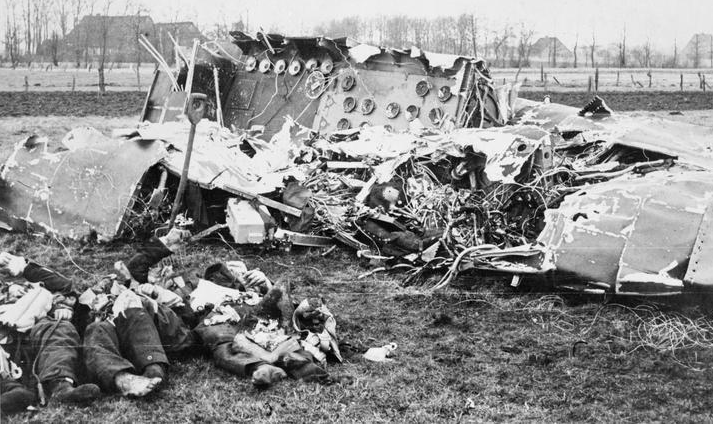 East of the Rhine, the tight-knit discipline of the bomber stream began to disintegrate. The more experienced crews recognised that the stream was not a place of safety in numbers and the slipped away, clawing for as much altitude as they could. Some aircraft went lower to avoid the vapour trails and watched burning bombers come spinning and crashing down past them. Some dumped their bombs and headed for home, to face the mother of all bollockings from the intelligence officers or their flight commanders if they had survived. Those who remained in the stream were the conscientious or the inexperienced crews that lacked the wherewithal to realise that they were in a death trap. Specialist illuminator fighters flew high above the bombers and dropped parachute flares to mark the stream’s track. It was the job of the gunners to report flares and exploding or crashing bombers for the navigators to log these events, but there were so many reports that the pilots told them to shut up. None of the crews had seen carnage on this scale. At 0045 the lead bombers were at the end of the long leg and turned south towards Nuremberg. These lead aircraft had managed to slip through the gap in the flak concentrations and were relatively unmolested by the night fighters, who had been hammering the main force. These were the Pathfinders whose job it was to mark the target, but what they were still unaware of was just how inaccurate the predicted Met forecast and wind speeds had been.